This has been a leftover special weekend. I have food I have to use up so I figure out something to make with it. 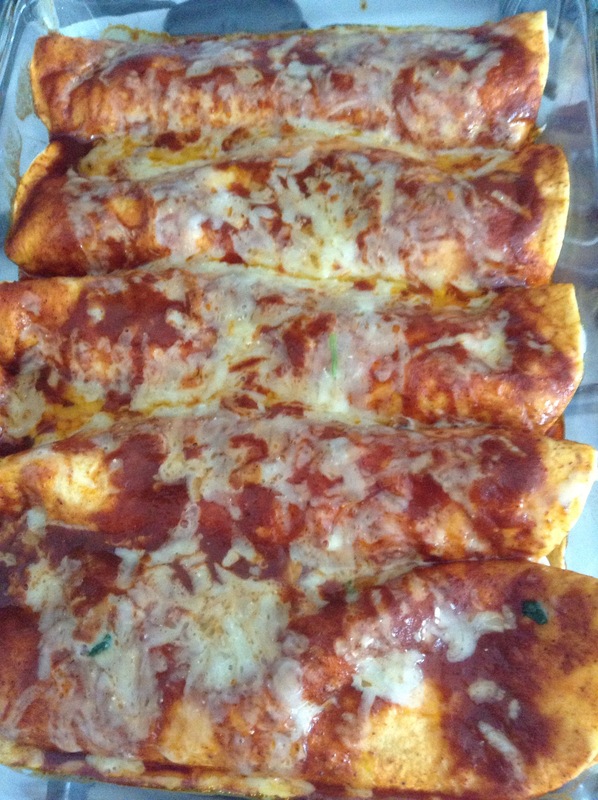 Yesterday was the kale salad, today, enchiladas. Every now and again Bob and I find ourselves with leftover cheese from our cheese club box. (Yes, we are still doing those because we love them and we love supporting our local cheese shop. Louise is always so helpful and honest – if a cheese is ok, but not great, she tells you. If a cheese is on the edge, she tells you – and if it is too ripe, she will replace it.) Normally we eat all if the cheese in a few weeks, but sometimes we just don’t get to it. So … I make something with it. Today I decided on cheese enchiladas with spinach. I though about plain cheese enchiladas but I did want some vegetable in there and spinach is easy. I started with a modified version of Emeril’s enchilada sauce. My version uses butter in place of oil, vegetable broth instead of chicken, and less chili powder and tomato paste. I do start with a roux, add the spices, add in the broth then the tomato paste. 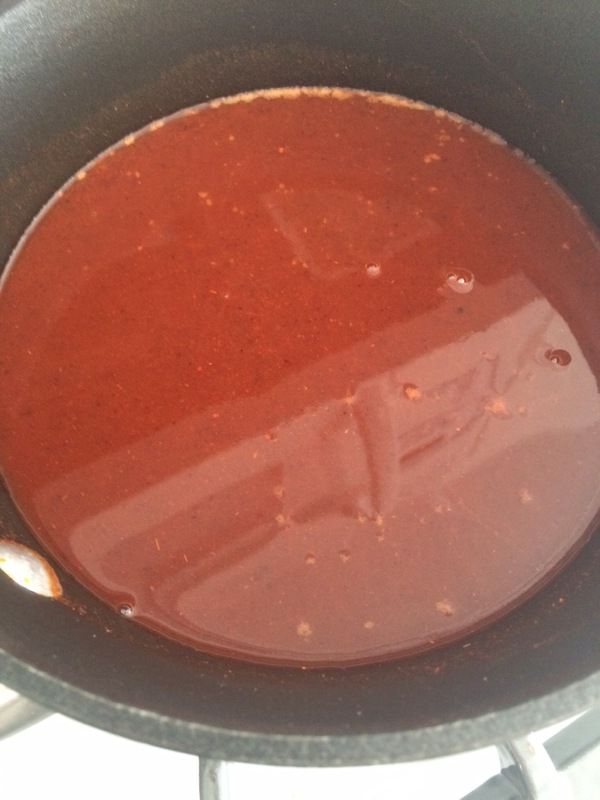 It works and is my basic red sauce for Mexican dishes. I decided to blanch the spinach, press it and chop it. I wanted the spinach in the enchiladas, but I wanted the cheese to be the star of the show. I also use flour tortillas because I like them way more than the corn ones. Yes, I know corn is healthier for you, but if I’m not going to eat it, what’s the point? These came out particularly good. The cheese was a mix of two cow cheeses on the inside and a little cheddar on top. Little cheese, little spinach, little sauce, and we have lunch. Bob liked the “cheese to other stuff” ratio and was glad the cheese was the main flavor. Best part about these – lunch tomorrow! Melt the butter in a sauce pan. Once melted, add the flour and stir to combine. 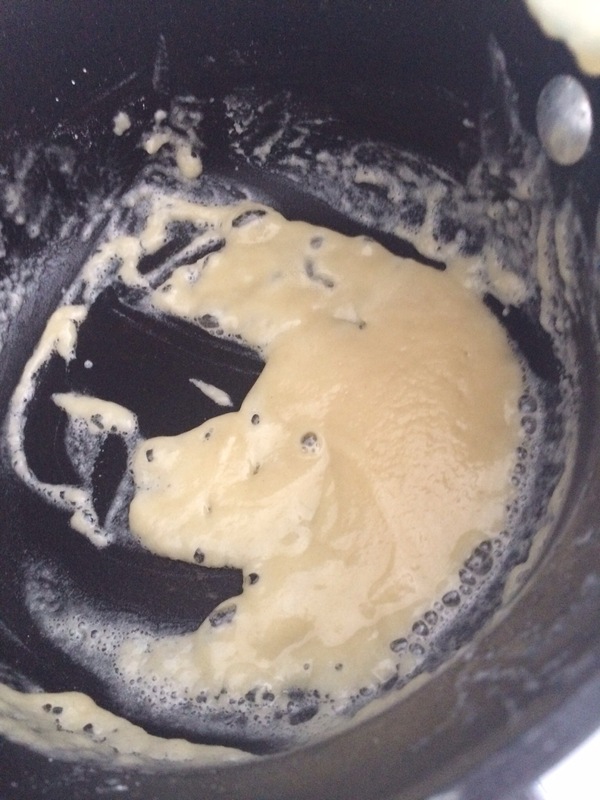 Cook for 1-2 minutes until the roux is bubbly and a caramel color. Add the chili and cumin and mix well. Add the vegetable broth and stir to combine, removing any lumps. Add the tomato paste and a pinch of salt. Bring to a boil and let boil for one minute, stirring frequently. Remove from heat. Blanch the spinach. Bring a large pot of water to a boil. Have a bowl with ice in it and a slotted spoon ready. 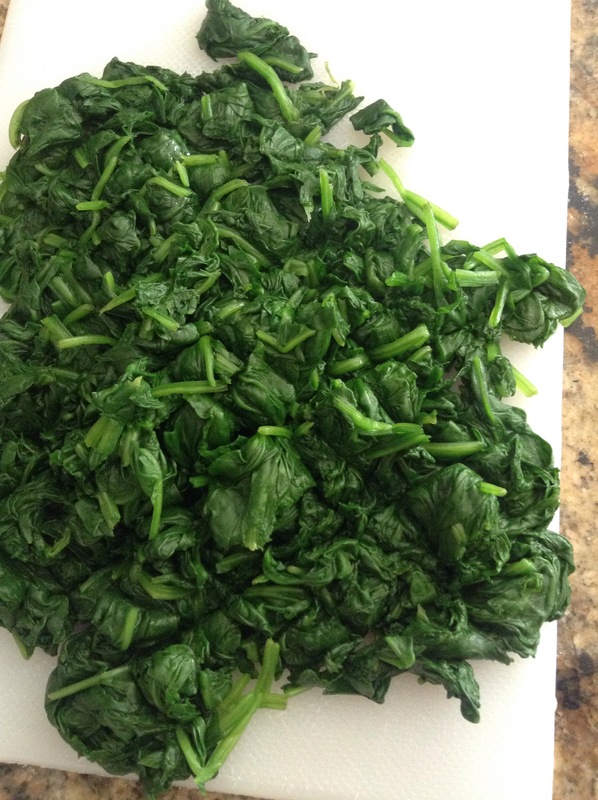 Add the spinach in large handfuls (about 3 ounces each) to the water and blanch for about twenty to thirty seconds. Remove from water, place over the ice to stop the cooking and repeat with remaining spinach. Once all of the spinach has been blanched, squeeze out any water and chop. Preheat oven to 350. Coat the bottom of a glass baking dish with sauce to prevent sticking. To assemble: coat each tortilla, both sides, with sauce. Place a good amount of cheese, about two to three tablespoons, along the center of the tortilla. 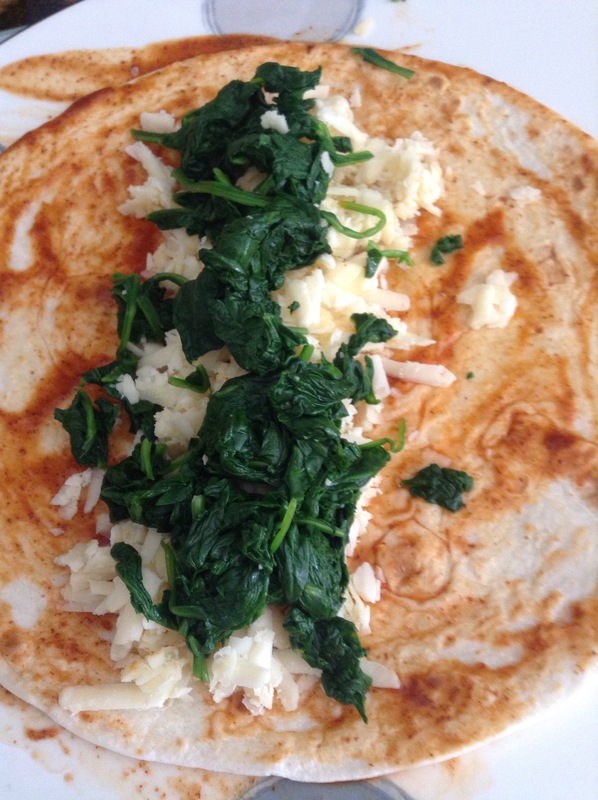 Add 1/6 of the spinach on top of the cheese, then roll the tortilla up and place fold side down in the prepared pan. Repeat until all tortillas are used. Spoon sauce over the enchiladas then top with more grated cheese. Cover with aluminum foil and bake about 20 minutes. The cheese should be melted and the enchiladas hot through.